I’m not much of a New Year’s resolution person. I could blame it on the fact that I often don’t finish what I’ve begun, and to some extent that may be true, but know it’s more about being someone who constantly takes stock, reflects, compulsively evaluates, over-analyzes, sifts, sorts, and thrives on general hair-splitting. It’s endless, so to some degree I welcome January 1 each year to think in a more focused way — at least that’s what I’ve convinced myself of. It’s really more about being able to sigh for the first time after a busy holiday season and quietly celebrate that I don’t have to cook anything too involved if I’m not in the mood. That for the first day in quite some time, mental lists, menus to plan, groceries to purchase, and errands to run aren’t interrupting a quiet moment, or causing alarm should something important be forgotten. It’s exhausting, and each year I vow to live through the holidays more graciously, more collected, and more as someone who enjoys and participates rather than orchestrates and delivers. And so I’m reflecting on our holidays today and remembering some of the delicious food we shared with those we know and love. It always allows us to pause long enough to enjoy one another’s company, to laugh, clink our glasses in a toast or three, and then smile at the quiet that comes after everyone has picked up their forks and begun to eat. 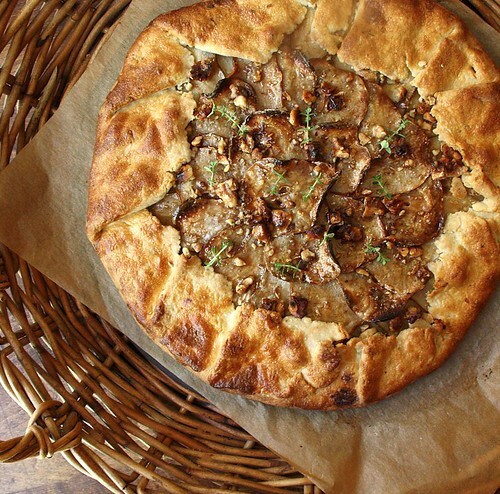 This beautiful and delicious Pear Gorgonzola and Walnut Rustic Tart was made on Christmas Eve in celebration of a special couple, recently engaged who happen to have a kitchen always filled with music, and often, dancing. Here’s to you Lisa and Steve! This year, there will be more music and dancing in my kitchen. I promise myself. Make the pastry first using by combining flour, salt, and thyme in the bowl and pulsing it a few times to mix. Add the butter in cubes all at once, and pulse until the mixture resembles coarse clumps. Add the ice water a dribble at a time, pulsing as you go, but only just until the dough begins to come together. Turn out dough onto a lightly floured surface and bring it together in a ball. Flatten with your hand, then wrap in plastic to chill for at least 30 minutes. Place pears in a large bowl or plastic bag and sprinkle flour over, tossing (or shaking if you’re using a bag) gently to coat. When the dough is chilled, roll it out on a lightly floured piece of parchment into a 1/8″ thick circle, about 18″ in diameter or so. Crumble the cheese evenly across the center of the dough, making sure to leave a border of about 2″. Arrange the pear slices over the cheese, then sprinkle over the walnut pieces, making sure to tuck a few here and there beneath the pears. Turn the edge of the dough up over the pears, pleating it as needed. Brush the pastry with a bit of heavy cream and transfer the tart to a baking sheet. 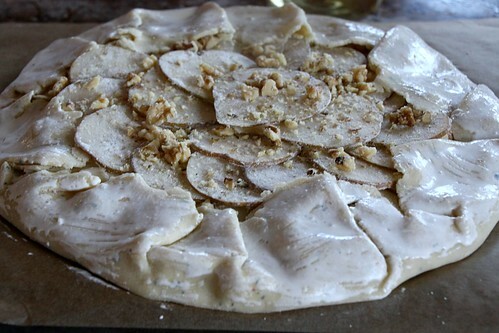 Bake for about 40-45 minutes until the pears and pastry are lightly browned. To make the glaze, in a very small saucepan, stir the agave nectar and balsamic vinegar over low heat. When the mixture is thin and easily poured from a spoon, add a pinch of fresh thyme and mix in. Use a brush to evenly coat the pears with the glaze. Sprinkle a few more fresh thyme leaves over before serving. This tart recipe was adapted from one found in desperation at a lovely site I recently found: Desserts for Breakfast. Fabulous recipes, great personality, and wonderful photography! We enjoyed it as an appetizer at a Christmas Eve dinner and it was well received, so thanks! 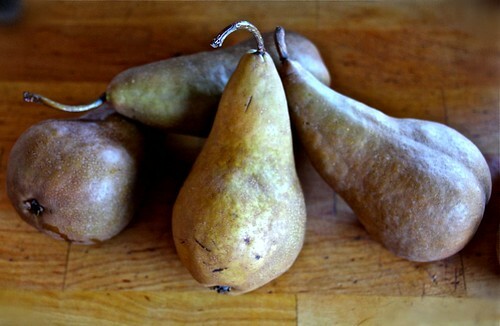 Pears are in season typically between July and January, with the bulk being grown on the west coast of the US. 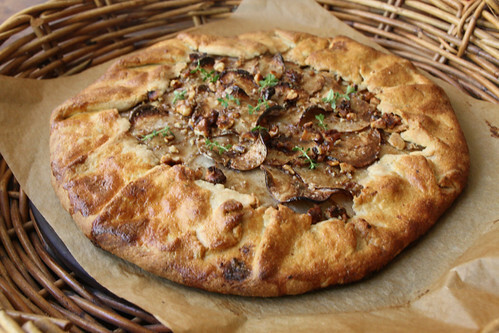 If you’re thinking locavore and/or seasonal, time is almost up to try this great recipe! Bosc pears, originally developed in Belgium, are perfect for baking and roasting because they hold up better, but if you can’t get pears period, then apples would work in this recipe. 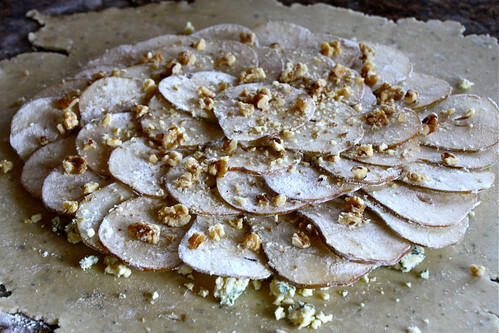 If you do have pears, but are picky about walnuts, then try this with almonds instead. Gorgonzola is produced in Italy’s Lombardy region and was originally called “stracchino verde.” The blue is produced when holes are poked into the aging cheese so mold can develop. If you turn your nose up — literally — at any blue veined cheese, you may be interested to know that when you cook gorgonzola, it sweetens, and mellows in flavor — like garlic! It’s perfect with pears — especially when cooked. But the combo is also fabulous in salads, souffles, and with pork. Mmm…we love gorgonzola and pretty much any blue veined cheese. When I make tarts like this, I use a round baking stone. They come in all sizes, shapes, and of course are made by a variety of manufacturers. If you’re interested in buying one, I’ll encourage you. The crust they help develop is fabulous! It can be a bit awkward getting the tart into the oven where the stone has been as the oven preheats. Either roll out the dough over a piece of lightly floured parchment, or cover a baking sheet or the back of a jelly roll pan with the parchment and slide the tart from the counter to the covered baking sheet. 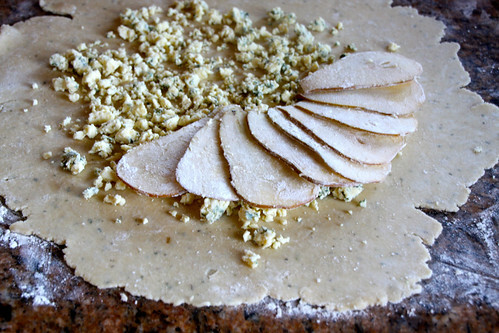 Then, transfer the tart to the hot baking stone by dragging the parchment. It sounds complicated, but it isn’t. Susan of Wild Yeast has written a great post written about the great results baking stones help achieve. There’s another great discussion about baking stones — specifically Pampered Chef stones — at the Fresh Loaf. I use one of those and have never had any problems with it. But I do need a larger one to use for bread. 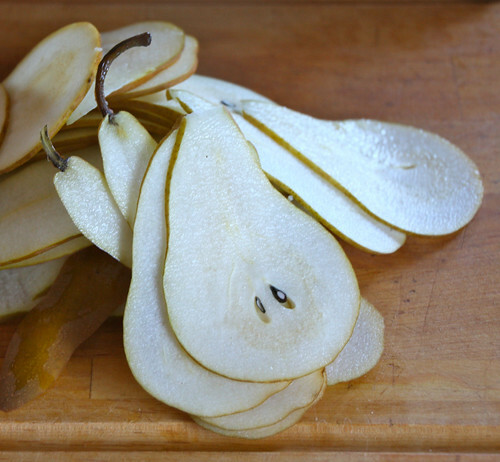 I used a mandoline to slice the pears because it gets them very thin, it’s quick, and they’re uniformly sliced. 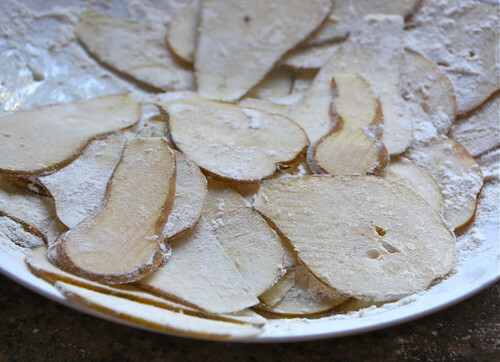 A mandoline is another great kitchen tool to add to your collection if you don’t have one. I started with an inexpensive plastic model until I was gifted one a couple of years ago — a Bron Stainless Steel. It’s a bit scary, but works very well. The guard that comes with most mandolines can make slicing some foods impossible because of their size unless you cut them first, so if you get one, consider purchasing a mesh safety glove as well. Bear in mind they’re only “cut resistant” so you still can’t slice with wild abandon. Perhaps controlled abandon. Caution? Right. If you don’t have a food processor, the dough can easily be made by pinching the butter into the flour mixture until pea-sized crumbs appear, then tossing the mixture in ice water until moist clumps form, and the dough begins to take shape. You know I prefer this method, but the processor comes in handy when I’m busy. This recipe comes together very quickly, but making the dough the night before helps save some time. Although I’ve not tried it, I’ll bet the constructed tart could be frozen if well wrapped, then thawed and baked.